Watermelon is one of those fruits we can all agree on. It’s cooling, refreshing, delicious and the perfect summer fruit (even though it’s September, we’re going to hold onto summer a little bit longer here). Watermelon is great in a wide variety of recipes such as smoothies or popsicles, but there’s another way to eat watermelon: in a salad! 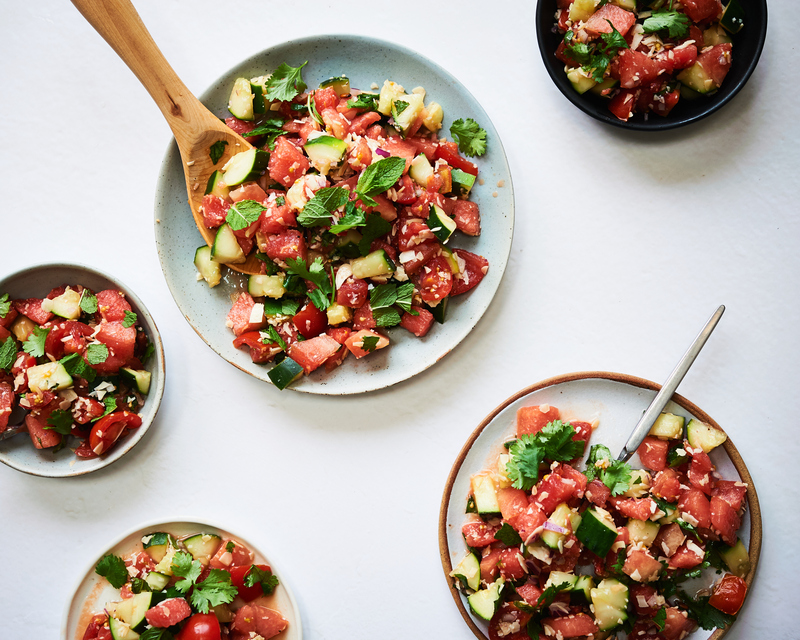 This recipe includes watermelon, tomatoes, cucumber, herbs, as well as pine nuts and nutritional yeast for additional health benefits and flavor. Instead of using feta cheese, which you’ll often see paired with watermelon, we’ve kept this recipe dairy-free and vegan by using nuts and nutritional yeast instead. You will find that watermelon compliments all of the ingredients in this salad recipe very well! Watermelon is not only delicious and refreshing but has many health benefits. Since watermelon contains both water and fiber, it is very hydrating and supports digestion. It’s high in an antioxidant called lycopene, which has antioxidant and anti-inflammatory properties. Watermelon also has Vitamin A and C, which are important for skin and hair health, as well as other vitamins such as Vitamin B6, magnesium and potassium, which are important for the heart. Parsley, mint and cilantro are not only a tasty addition to this salad, but offer some health benefits. Cilantro is a good source of fiber, vitamins A, C, E, K, calcium, iron, potassium and magnesium. Cilantro also has high amounts of phytonutrients and phenolic compounds, and contains a flavonoid called quercetin, which has been linked with helping to reduce inflammation. Cilantro even contains some antibacterial compounds. We hope you give this delicious, dairy-free, vegan and refreshing summer salad a try. Check out the recipe below and see for yourself how simple it is to make. Please let us know if you make the recipe! We’d love to hear from you or see a photo of your salad if you post one on Instagram or Facebook and tag us. Chop all of the veggies and watermelon. Chop the pine nuts (or slivered almonds) and mix it with the nutritional yeast in a small bowl, then sprinkle the mixture evenly over the salad. In a small bowl, whisk together the lime juice, avocado oil, sea salt and pepper.